Joseph Pensak, who founded and directs New City Galerie, doesn't always curate its fascinating shows, but he did create the current one, "Pangs." In it, he brings together work by Susan Smereka, the gallery's head art handler and assistant curator; Ali Palin; and Misoo (formerly Misoo Filan). Pensak's curator's statement, consisting of a couplet from a poem in Rainer Maria Rilke's The Sonnets to Orpheus, suggests that all three artists operate "among the waning" and "in the realm of decline," in Rilke's words. Indeed, each artist's work expresses personal pain or loss. While this theme isn't obvious from the artworks themselves — though their muted (Palin), pale (Smereka), and black-on-white (Misoo) palettes might evoke the underworld through which Orpheus travels — it emerges from the artists' statements and their previous shows. Palin's contribution to "Pangs" is a group of 45 small paintings depicting remembered corners and rooms in the northern Vermont dairy farm that was her home until age 11. Each image is indistinct, softened in focus, in keeping with the dimness of memory. But because the panels are the size of 4-by-6-inch snapshots, a sense of documentation hovers. A barn interior, with its rows of slanted-roof windows, might owe its haze to dust motes catching the light or to memory. As documents, these images convey sadness: The farm's buildings were burned for firefighter practice while Palin's elderly grandfather looked on, the artist writes. Misoo offers two abstract works in black ink and pencil on large sheets of white Yupo paper. Each is 60 inches wide and so long — 15 feet — that they scroll onto the floor. Hung this way, they suggest a person standing with her back to the wall who has slid down to a sitting position, legs extended. 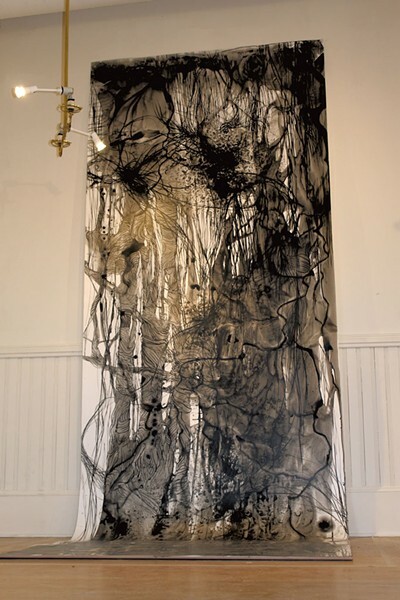 One of these works is "Bartholomew," with its spilled ink and flowing pencil work resembling hair, which local gallerygoers might remember from Misoo's 2017 solo show at the University of Vermont's Living/Learning Center Gallery. In that show, she first revealed that her subject was a traumatic memory of sustained sexual abuse, the hair a visual synecdoche for the Asian female victim. Misoo's more recent work at New City, "Weeping Willow," appears to signal even more violence with its chaotic networks of tangles and knots in spilled ink. These overlie tree-trunk-like shapes, as if attempting to graft onto and overpower them. But the trunks remain rooted and upright — perhaps a reference to resilience. Art New England magazine selected Misoo as one of 10 "emerging New England artists" to watch in its March-April issue. 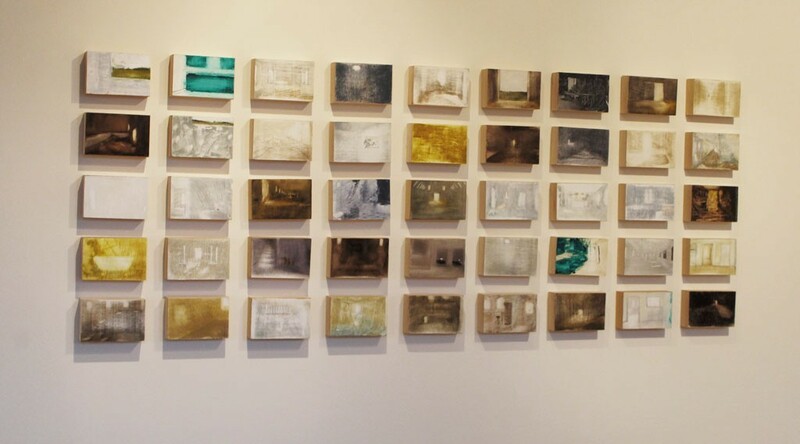 Eleven works by Smereka, sewn together from old book pages, make up most of "Pangs." Smereka was an artist-in-residence at New City Galerie in 2015 and co-curated a show at the end of that year called "Bookbody," which emphasized the parallels between book bodies and human bodies. During the residency, her brother committed suicide, a trauma reflected in actual books Smereka made for that show. Seven Days reviewer Rachel Elizabeth Jones called it "a show about text." In the current show, Smereka pursues that interest with new complexity. Her artist statement consists of a pun-filled poem that connects death with dismantled books and coping and rebuilding with making her art. Yet the works themselves almost entirely hide or exclude printed text. That sets her apart from, say, Vermont artist Matthew Monk, who makes collages of vintage book pages and discarded scraps of pages that often include printed text, marginalia and the like. Instead, what viewers see here are blank book pages, yellowed with age, cut into thin strips and sewn together. Machine stitching is visible around each strip in some works. Surfaces are minimally printed with patterns, not text, in black ink, and occasionally augmented with collage or zigzag stitches in an accent color. These works clearly require a different approach to reading. "Outer Gate" is a rare piece by Smereka that includes print. 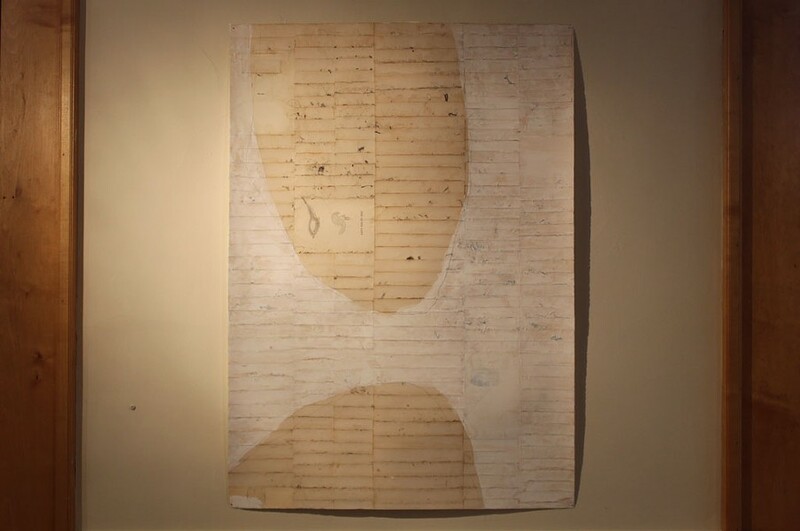 The 42-by-30-inch work is made from narrow strips of old book pages arranged horizontally and overpainted with translucent white except for two large half-lozenge shapes. A vintage half-title page turned on its side bears the words "The Outer Gate." Another uncut page, which spans painted and unpainted areas, reads "The End." Bits of dust and hair have caught in all the seams between the strips of paper. If the artist is emphasizing the materiality of the body here, it's with deliberate opacity. The grid-like construction of the paper strips vies with the biomorphic shapes created by the white paint; there are layers to get through, gates to pass, only to reach "the end." Smereka's severe minimalism favors the incomplete. "Vortex Arm" bears a monoprinted shape cut off by the work's left side. Its installation, flush with a corner made by two walls, nearly integrates it into the gallery itself. "Now It Can Be Told" and "The Guiding Hand," both 42 by 28 inches, are hung as a pair so that the monoprint on one — a truncated, horizontal dumbbell shape — appears to find completion in the other. Up close, the impression dissolves: The pattern of lines in one monoprint is turned 90 degrees from the other's. It is the sparest way imaginable to communicate pain. The original print version of this article was headlined "What Comes of Loss"